Gareth McAuley is the blueprint for any aspiring Irish League player to follow. At 37 years-old, the towering centre-back has played every minute of West Bromwich Albion’s Premier League campaign so far this season. And he’s become something of a striking star - netting six league goals - more than England’s Wayne Rooney. Playing for Coleraine until he was 24, it was hard to foresee his rise to stardom, especially in a professional football culture that usually snaffles NI’s top talents when they’re little more than boys. “He’s a great example to our own domestic league,” said Northern Ireland boss Michael O’Neill. 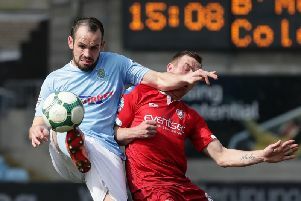 “We don’t produce enough players and in recent times, if you look at the squad, there’s only (Liam) Boyce, (Stuart) Dallas and Niall (McGinn). McAuley now has 70 caps for his country but with every passing game, his influence for Northern Ireland only seems to increase - embodied not least in his heroic goal against the Ukraine in France. “To me he’s a better player now than he was when I took the job,” said O’Neill. “Playing in the PL has made him a better defender. He gets the chance to play against Diego Costa, Lukaku, it’s something he relishes given that he’s getting it in the latter stages of his career. To be able to improve at that age is probably very rare. West Brom is something of a Northern Irish footballing hotbed these days. Jonny Evans and Chris Brunt are more often than not named alongside McAuley in Tony Pulis’ starting XI - and that can only help when the trio continue to link-up on the international stage. “West Brom’s been good for Jonny – playing consistently and being such a significant player there,” continued O’Neill. “It’s also been good for Gareth as well. “I suppose when a player gets to (Gareth)’s age, as a manager you’re always thinking about how you’re going to replace him. You look at Gareth and you go, ‘right, how much do I have to spend to replace him? I’m better just giving him another year,’ which is what West Brom continually do and rightly so. Recent reports suggested McAuley is unsurprisingly in line for another extension to his six year stay at the Hawthorns. While it would cost a substantial sum for Tony Pulis to replace the centre-back, his influence at international level consistently proves priceless for Northern Ireland.